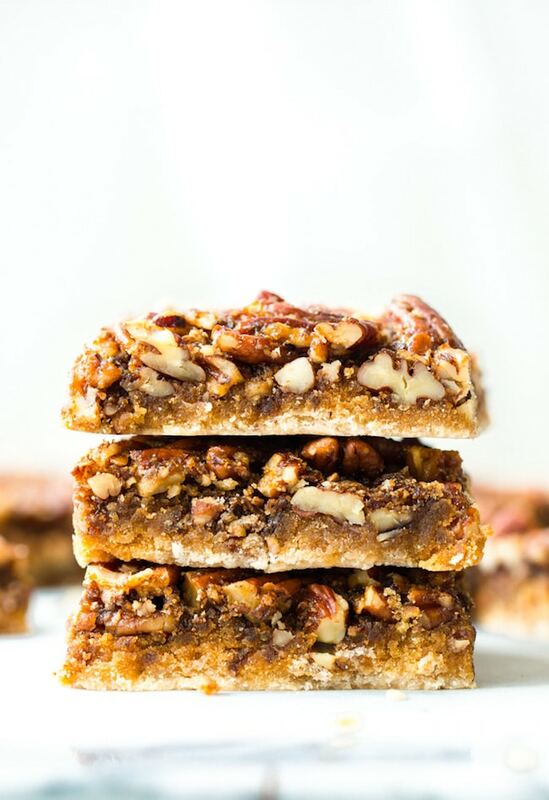 Paleo Vegan Pecan Pie Bars – A simple coconut flour base topped with a gooey caramel pecan topping. A healthier take on a Thanksgiving classic! 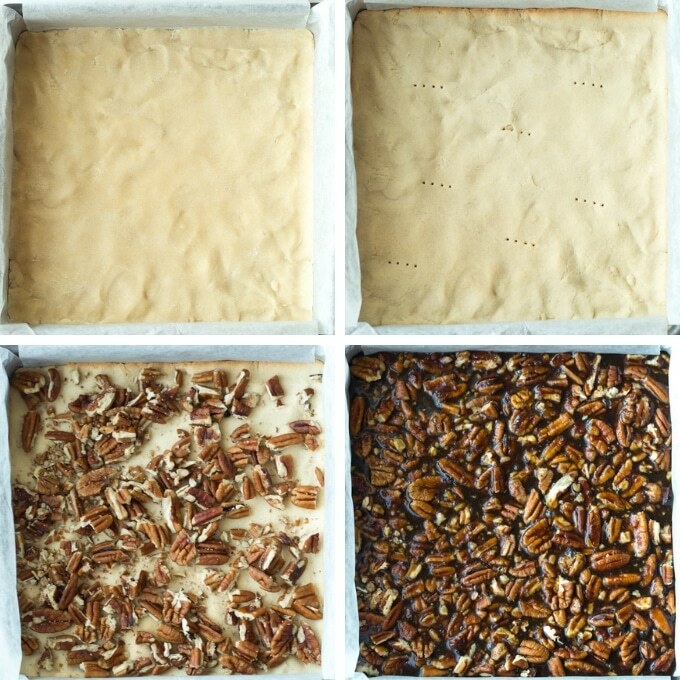 Now that we’re well on our way through November and on to Thanksgiving I figure it’s about time for a little pecan pie goodness in the form of these paleo/vegan pecan pie bars. Let’s start with the crust! Altogether the crust is made up of only 3 ingredients and takes about 15 minutes to prep – including the bake time. It’s a simple, coconut flour shortbread crust based off of the one found in these paleo millionaires shortbread. It’s made up of: coconut flour, coconut oil and maple syrup. Just mix those three ingredients together in a bowl until a soft dough forms and then press into a lined 8x8inch baking tin. Poke a few holes into the crust so that it doesn’t puff up during the bake and then pop it in the oven for about 10 minutes until the edges start to turn golden. Remove from the oven and then set aside too cool down while you prep your caramel pecan filling. 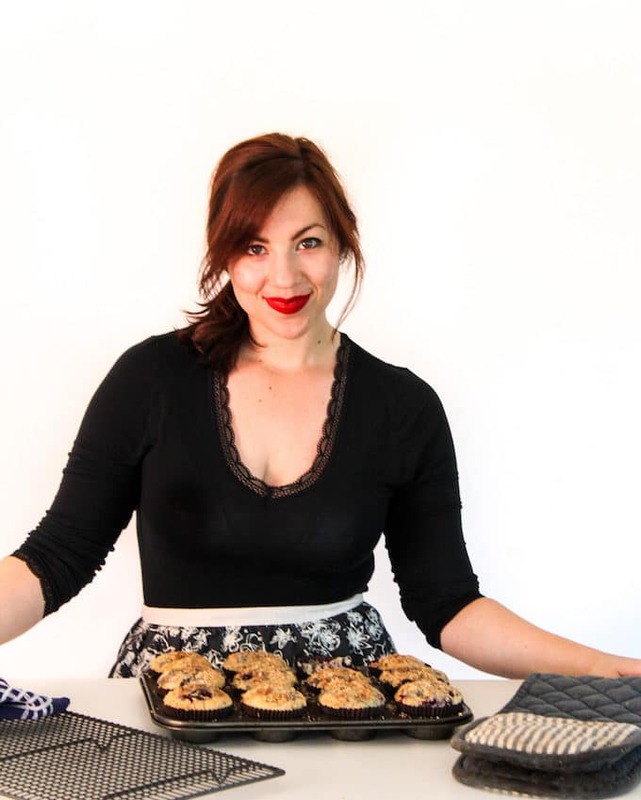 Begin by making your flax eggs: mix together a couple tablespoons of ground flaxseed with a little bit of water and set aside to let the mixture gel up. This mixture will help to bind and set your filling after baking. Once that’s done you can move on to melting the coconut oil, coconut sugar, maple and salt together in a sauce pan. Simmer to melt the coconut sugar and then bring to a boil for about 30 seconds before removing from the heat. In a small bowl or cup whisk together the almond milk, vanilla extract, starch and the flax egg mixture and then pour into the sugar mixture. Whisk it all together until combined. Stir in 1 cup of the roughly chopped pecans. Scatter the remaining pecans over the pre baked crust and then pour the filling over the top. At this point all you need to do it throw it all back in the oven and bake for another 25 minutes and that’s it. Make sure to let the bars cool and set about two hours before cutting in to and that’s it! 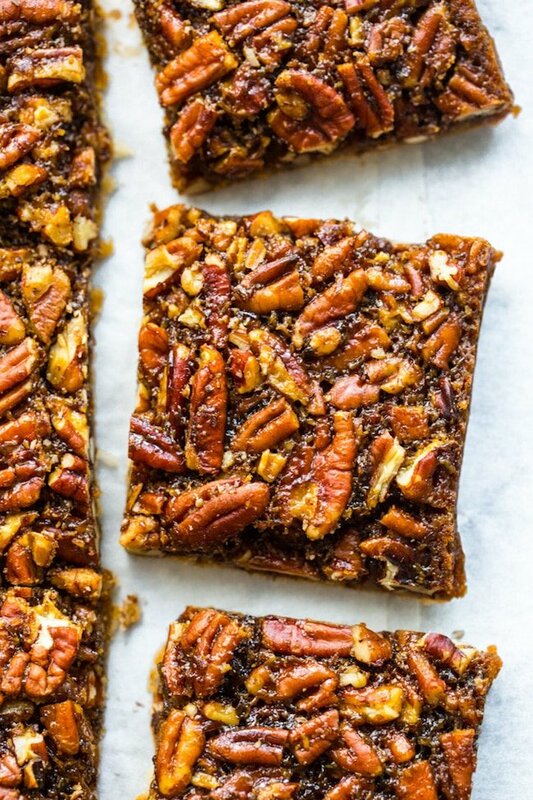 Don’t forget to #asaucykitchen on instagram if you try these Paleo Vegan Pecan Pie Bars! We love to see what you make with it! You can also post your pictures to our facebook page! 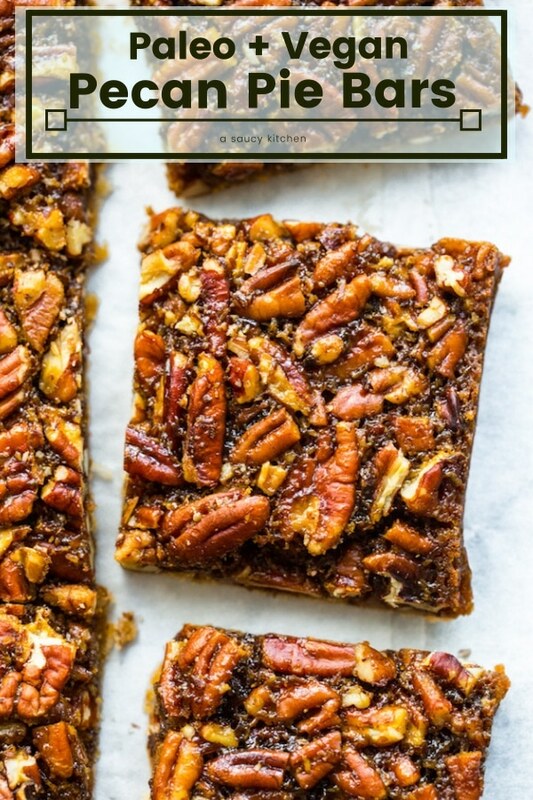 Paleo Vegan Pecan Pie Bars - A simple coconut flour base topped with a gooey caramel pecan topping. A healthier take on a Thanksgiving classic! Preheat oven to 350°F/180°C. Line a 8x8inch baking tin and set aside. In a mixing bowl add the crust ingredients (coconut flour, coconut oil and maple syrup) and mix until a soft dough forms. Press the dough into the lined baking tin in an even layer. Poke a few holes across the crust and bake for 10 minute until the edges are golden. Remove from oven and set aside while you prepare the filling. Reduce the heat to 325°F/160°C. Add the coconut oil, coconut sugar, maple and salt to a medium sized sauce pan. Whisk together and melt over a medium-low heat and simmer. Bring up to a boil for about 30 seconds and then remove from the heat. In a small bowl or cup whisk together the almond milk, starch, vanilla extract and flax egg until no lumps remain. Pour that mixture in to the sugar mixing and whisk to fully combine. Scatter 1 cup of the chopped pecans over the prepared pie crust. Stir the remaining pecans into the filling. Pour the filling over the crust. Place in the middle of the oven and bake for 25 minutes. Remove from oven and let cool for 2 hours before cutting in to. Enjoy! Would it be ok to sub maple sugar instead of coconut sugar? Hi Nikki! I haven’t tried these myself with maple sugar but I do think they would work! I made the pecan bars. After I made it I realized that a left out the salt because the receipt left it out. The cake tastes good but it is missing the salt. My mistake! Thanks for pointing that out to me! So glad you still enjoyed it! Oops! My mistake – should have been more clear here. The flax egg is referring to the water + flax seed combo listed in the ingredients. These two when mixed together gel up and is a common used vegan egg substitute. Would these be better stored in the fridge or counter overnight? Either way is fine! Unless you live in a really hot place the counter top should do it! Tried this recipe out tonight and it was tasty, thanks for sharing! I didn’t have any arrowroot starch or tapioca starch on hand so I tried subbing an equal part xanthan gum. The crust turned out kind of soft and spongy, I’m wondering if it is normally a little more crisp and flaky with the other starches? Yay! So glad you liked them! Thanks so much for coming back to let me know what you thought! As for the crust – the coconut flour does make it pretty soft. Almond flour would be a good flour to use for a more crispy crust. You could use a combo of almond flour and starches but I think too much starch would make it really chewy. If you do decide to play around with a different crust keep in mind that you’ll need a lot more flour than coconut flour. I love pecan bars! These look so delicious and I love that they’re vegan!